I have been hoping to do two walks a month whilst on sabbatical in 2019, but my first window in March didn’t get used thanks to a combination of crap weather and crap sinuses — you don’t want to know any more about either. 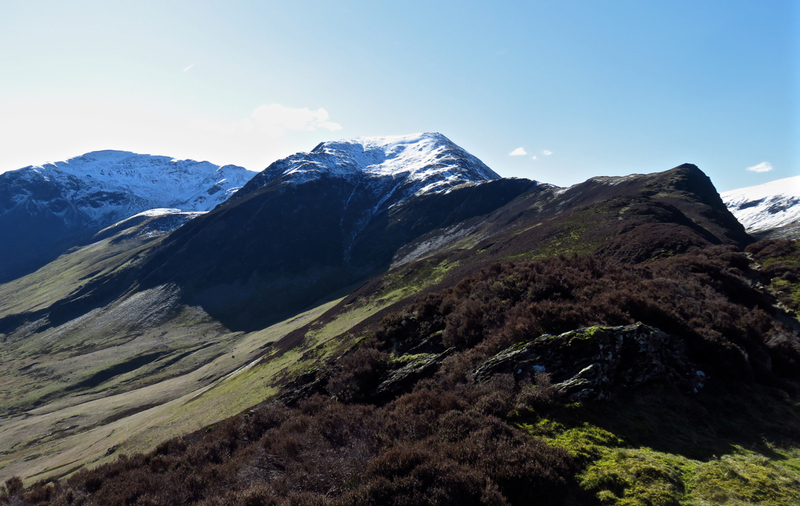 But today, 19th March, things opened up and walk 160 happened, as I was able to head for Borrowdale and bag three summits: High Spy, Maiden Moor and Catbells. The weather was definitely mixed — but this permitted some decent photography and nothing really wet got in my face. This was a very good walk, easy to access and not too strenuous while having magnificent views. I recommend it — so have a look at the further detail on the walk 160 page. Upper Newlands. Hindscarth to right, Blea Crag to the left. As of today, then, I have bagged 193 of the 330 Wainwrights on my second round, and therefore have 137 to go. Actually I’ve had a pretty good run recently: in the last 3 months, since 20th December, I’ve bagged 23 summits; prior to that it took me six months to bag the same number. So I’m fulfilling my promise to pick up the pace. But no more for a month now — I can’t do it, I’m away, thousands of miles away. 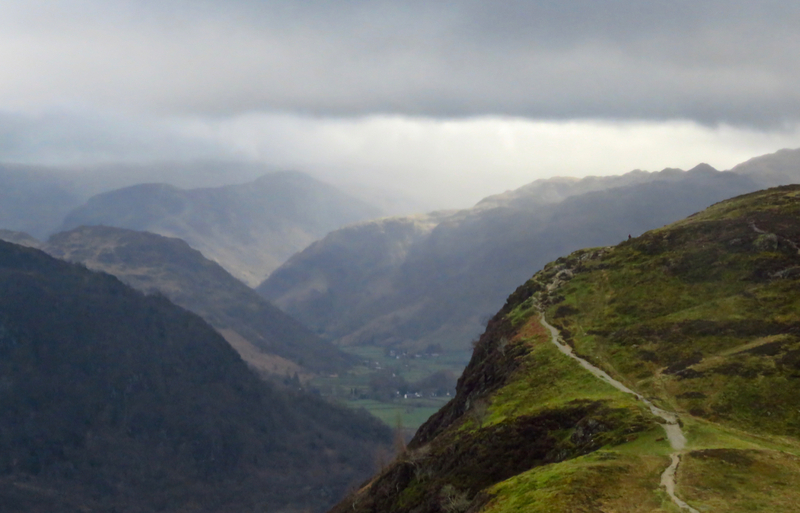 The earliest I’ll get back to the Lakes is around the Easter weekend. But it’ll happen. Of course. Looking south from High Seat, towards High Tove and Ullscarf. Much of the walk looks similar. It has rained very little in the last six weeks, making this probably the driest period we’ve had since I started on these walks way back in 2009. 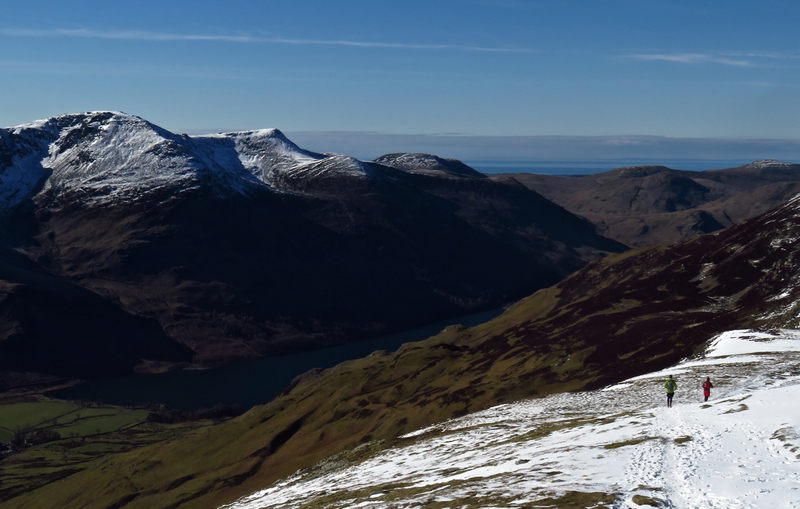 I decided with walk 147 to risk an expedition into one of the Lakes’ most notoriously wet regions, the central ridge between Bleaberry Fell in the north, and the pass of Greenup — a ridge which also takes in the summits of High Seat, High Tove and Ullscarf along the way. The gamble worked. Obviously a vile swamp in wet, or even normal, weather, the dry weather has turned it into reasonably good turf at the moment. I was able to do 14 miles in 5:15 and thus get the walk done at a decent hour — despite the ineptitude of Northern Rail, it getting me to Penrith an hour late this morning, and its current inability to provide a train service to Windermere for anyone. That’s another story — but if interested you can read about it in the comments on the walk 147 page, where there are more photos, the usual route details, etc. 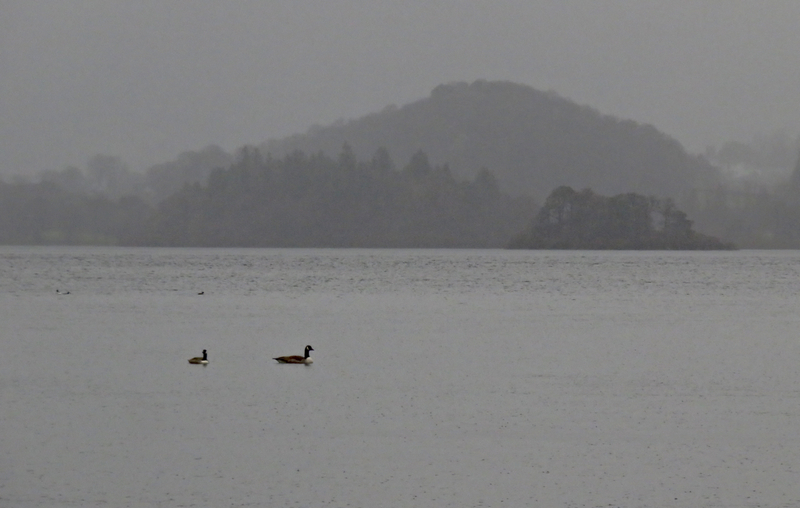 I had not managed to get to the Lakes since the first week of February, due to a combination of having too much work to get on with, then poor weather forecasts on the days I did have free. Had I not made a walk yesterday (March 18th), March would then have passed without a walk in it either. 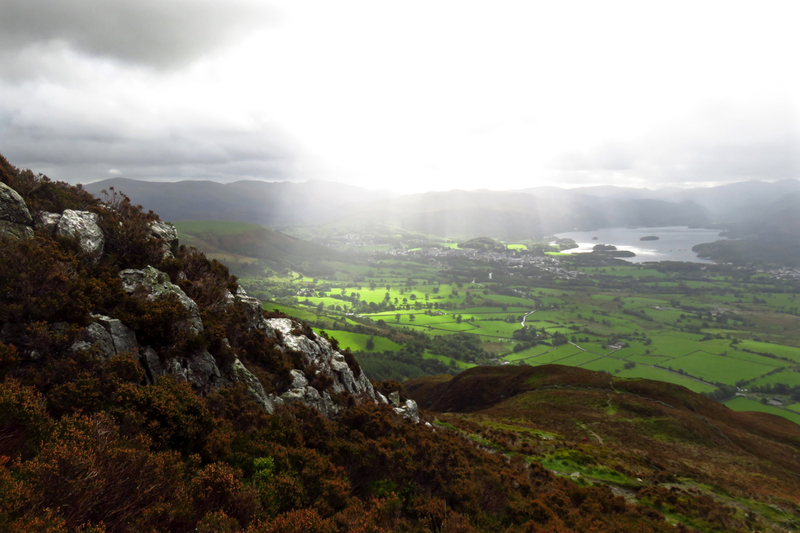 Not wanting to extend the famine therefore, I took a risk with the weather, strapped on the waterproofs and headed up to Keswick for what became walk 125. 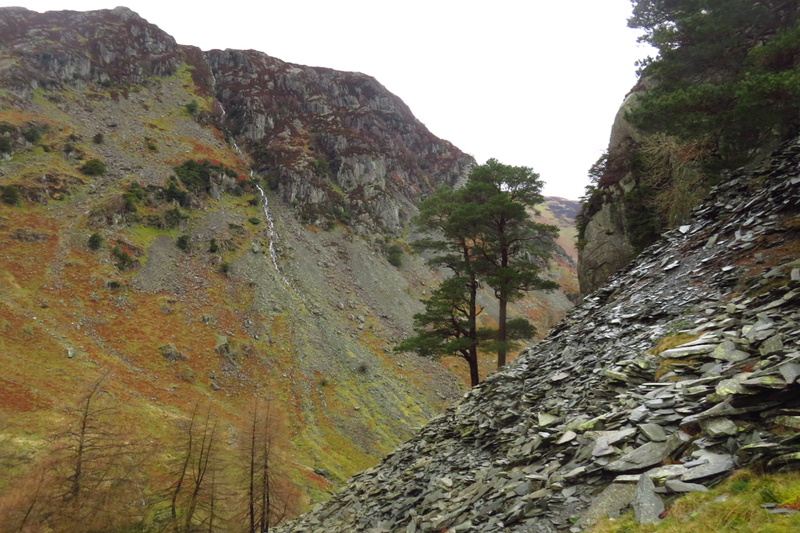 I headed down the west shore of Derwentwater, walking the length of the lake to Grange then bagging Castle Crag as (for the second time) the sole fell on a walk. Still worth doing — it’s a great, rugged little summit — though the weather was obviously a little disappointing. This definitely counts as a wet walk! It rained almost all the way round, not heavily, but persistent drizzle. Ah well, I needed the fresh air and it’s all good exercise, and the scenery is beautiful in any weather. Lots of people agree, as the walk was very busy, despite the weather. Read more about it, with further pictures, on the walk 125 page. I’m off to Japan on Monday, a shame I will have no time there to do some walking as by all accounts there is some excellent hiking to be had in the country. Maybe next time. 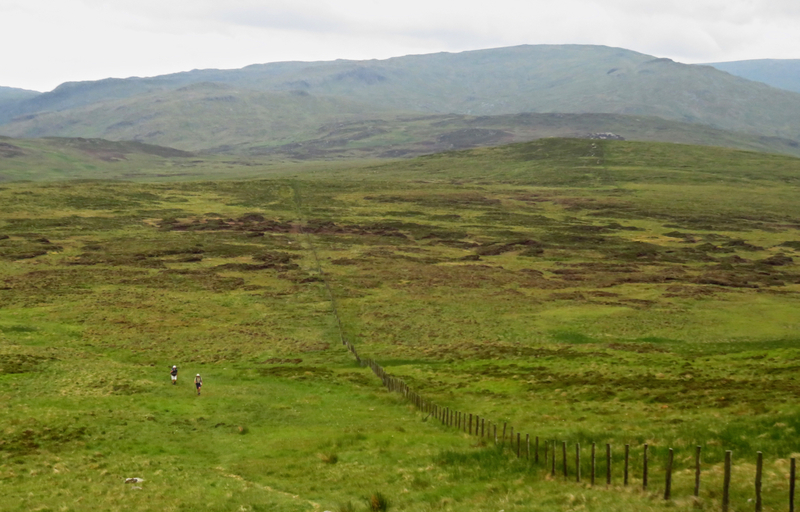 In terms of home — with the summer bus service starting again on 8th April it is definitely time to get into the west of the District once more, back into the higher fells. As of today I have done 91 of the 330 Wainwrights on my second round, thus have 239 to go. Some weather is dubious for walking at best, but there are other reasons to welcome a forecast of ‘sunshine and showers’. On walk 118 I was being battered by hail at one point, and this was the windiest walk for some time. However, there were also advantages to it. I was up on the southern side of the Skiddaw range, bagging Carl Side and Dodd, and Wainwright was once seen to mutter (in the Skiddaw Little Man chapter as it happens) that the view south from these fells is the best in the District. I would be inclined to agree with him, as you can see here. There are several other pictures like this up on the walk 118 page. Spectacularly beautiful day in the Lakes today — and I managed to work Sunday (yesterday), and a bit this morning, to shift things around and get a walk in to make the most of it. And very bloody worthwhile this was too, I have to say. 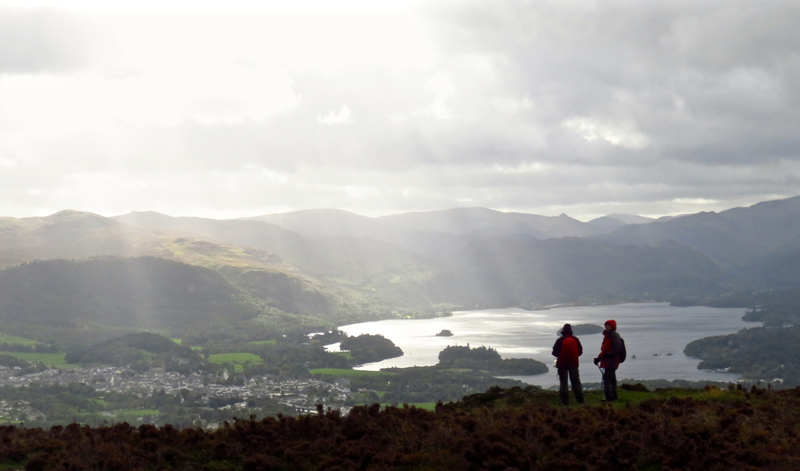 One of the best days’ walking I have ever had in the Lakes, weather-wise. Walk 107 took me from Keswick up the Newlands Valley, then via the Scope End ridge to Hindscarth and Dale Head, before dropping down to Honister then ending the walk in Seatoller. 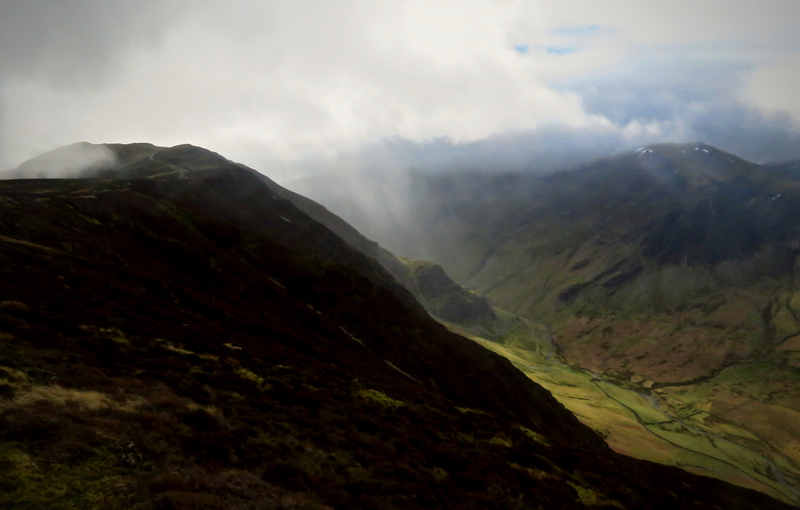 Hindscarth and Dale Head thus became numbers 27 and 28 of my second Wainwright round: thus, I have 302 to go. Next walk (two, if I have anything to do with it) in the week immediately after Easter. Hindscarth from the ascent of Scope End. 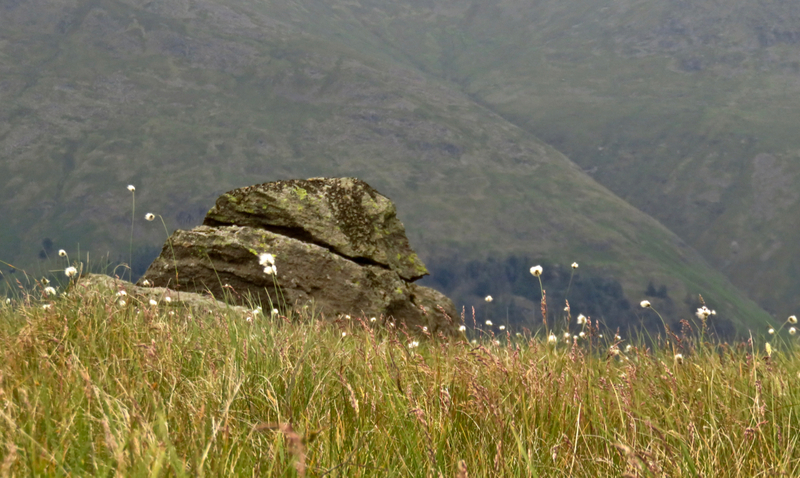 Dale Head in the background.